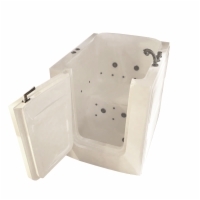 Sanctuary's Easy Soak Petite is perfect for replacing existing shower stalls and can also be used in small bathrooms or mobile homes. It's made from industrial strength acrylic that will stand up against chips, scratches, and stains over a long period of time. A full set of whirlpool and air system options are available, even though the Easy Soak is a small unit.